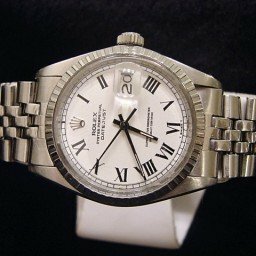 BeckerTime is proud to offer this handsome Mens 36mm 100% GENUINE ROLEX Stainless Steel Oysterquartz Watch w/White Roman Dial ref #17000 that is guaranteed to impress! this is a limited production quartz movement timepiece that is no longer offered by Rolex! Band Rolex stainless steel integral oyster bracelet with Rolex signed clasp is in excellent condition. 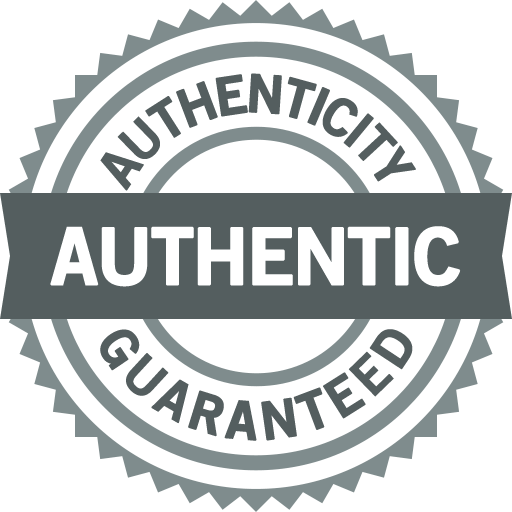 AS WITH ALL OF OUR WATCHES, AUTHENTICITY IS GUARANTEED! THIS IS A FILE PHOTO.What does that mean? You may be asking why we use file photos… When we have more than one of the same item… we will only take pictures of one of the items. The item will be in the same condition and be as described. This helps us keep our costs down and pass the savings onto the buyer. Additionally, we have a 30 day unconditional money back guarantee. We don’t use file photos for every item… but only when the item will be the same as pictured and described. (There may be slight variances that most buyers may not even notice.) Please keep in mind that many of our competitors use file photos as well, but will not disclose this information to you. We are committed to being fully transparent. This is why we provide a disclaimer in the product listing if file photos are being used. New. Perfect condition and never worn. The watch has the original manufacture’s protective plastic (if applicable). It comes with original box and papers. It is working properly, keeping very good time. New. Perfect condition and never worn. The watch has the original manufacture’s protective plastic (if applicable). It may or may not come with original box or papers. It is working properly, keeping very good time. Perfect. Looks never worn. As close to new as you can get for a preowned watch. This is the equivalent of a new watch that does not have the original manufacture’s protective plastic (if applicable). If you remove the protective plastic from a brand new watch, and have not yet worn the watch, it is now in Super Mint Condition. It may or may not come with original box or papers. It is working properly, keeping very good time. Near perfect. Looks like new on the wrist. Signs of wear are only visible with a loupe. The band has no stretch or wear. The watch is working properly, keeping very good time. Super nice. Very light signs of wear. Watches with the original band will have minimal stretch between the links. The watch is working properly, keeping very good time. Nice. Signs of normal careful wear. Watches with the original band will have moderate stretch between the links. Some older watches with the original band may have more than moderate stretch. The watch is working properly, keeping good time, but may gain or lose up to 30 seconds over 24 hours (unless the watch has been serviced). Fair. Signs of heavy wear. Watch may have a few dings, nicks, or deep scratches The band has severe stretch between the links. The watch is working, but may gain or lose a few minutes over 24 hours (unless the watch has been serviced). Poor. Signs of extreme heavy wear, damage, or abuse. Major cosmetic and/or mechanical flaws that directly affect the integrity of the watch. The watch may be missing parts and/or may not run at all. We do not recommend this watch to be worn in this condition. Requires a lot of work to be made wearable. A watchmaker looking for a “parts” watch so they can use the “usable” parts to service or restore their customer’s watches. A buyer that is looking for a challenging “fixer upper” watch. A speculative timepiece. They understand that lot of work must be done to this watch to be made wearable. A buyer that is looking to replace a “lost” or “family heirloom” watch that in this condition. For many people, a Rolex is so much more than just a timepiece. The watch arrived today and exceeded all of my expectations! My watch is running perfectly. Thank you for the good service! Thanks so much, you've been very patient and answered all my questions! Best seller I've ever dealt with. Very thorough and understanding. Flawless service, workmanship, value and quality, the best rating! Beckertime was the real deal... Thank you all for everything. I will purchase from Beckertime again! I would highly recommend their Service/Sales to Anyone! Midsize — "For ladies wanting a larger watch. This is the size exactly in-between the men’s & ladies size." All box and papers do is guarantee the box and papers are authentic. The bad guys know that people put trust into original papers so by putting genuine papers with a fake watch allows them to pull off a scam...and when the buyer finds out down the road the watch was fake, the scammer is long gone. The only way to check authenticity is by having the watch checked. As with most preowned watches, the original box and/or papers are not available because they were not retained by the original owner. This warranty applies to the movement of the watch only. Watch movements are warrantied to perform as described in the BeckerTime item description during the warranty period. This warranty does not include the battery, strap, links, clasp, case, crown, bezel, dial, hands, screws, crystal and/or diamonds. 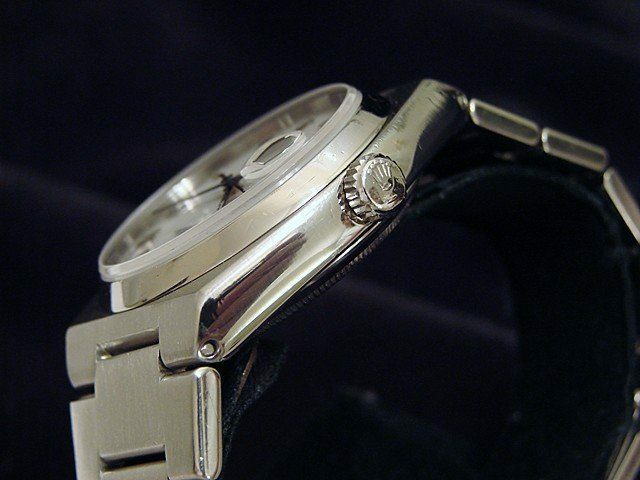 Damage to a watch due to accident, neglect or mistreatment is not covered by this warranty. Mistreatment includes modification of the watch through the addition or substitution of parts or accessories not provided by Beckertime and will void this warranty. Also not included is the loss or theft of the watch or any damage done by loss or theft. Damage caused by fire, pressure or natural disaster is not covered. This warranty does not cover any water damage—including crystal fogginess, movement damage, dial or bezel damage, seals, gaskets, liquid penetration and any issues pertaining to water. This warranty replaces the original manufacturers warranty. New. Perfect condition and never worn. The watch has the original manufacture's protective plastic (if applicable). It comes with original box and papers. It is working properly, keeping very good time. New. Perfect condition and never worn. The watch has the original manufacture's protective plastic (if applicable). It may or may not come with original box or papers. It is working properly, keeping very good time. Perfect. Looks never worn. As close to new as you can get for a preowned watch. This is the equivalent of a new watch that does not have the original manufacture's protective plastic (if applicable). If you remove the protective plastic from a brand new watch, and have not yet worn the watch, it is now in Super Mint Condition. It may or may not come with original box or papers. It is working properly, keeping very good time. A watchmaker looking for a "parts" watch so they can use the "usable" parts to service or restore their customer's watches. A buyer that is looking for a challenging "fixer upper" watch. A speculative timepiece. They understand that lot of work must be done to this watch to be made wearable. A buyer that is looking to replace a "lost" or "family heirloom" watch that in this condition. For many people, a Rolex is so much more than just a timepiece. We do NOT guarantee timing accuracy, consistency or functionality in any way unless we service this Rolex prior to shipping. Due to the age of this timepiece, Rolex no longer produces parts for this generation model's movement. This means that Rolex will not be able to service this timepiece. You will need to have access to an independent Rolex watchmaker that has (or can source) used original Rolex and/or new aftermarket parts for this movement for routine service and maintenance. If you are looking for a more reliable timepiece that comes with a warranty, we suggest looking at a newer generation of this model so that Rolex would still produce parts for the movement. With all that being said, we can service this watch prior to shipping for an additional cost. The estimated time frame is 2 to 4 weeks. Please keep in mind that because our Rolex Master Watchmaker would be replacing any worn out parts with used original Rolex and/or new aftermarket parts, the service/maintenance requirements may be more frequent compared to newer models. It's important to note that having a vintage Rolex watch serviced does not mean it will function and keep time like a new watch. 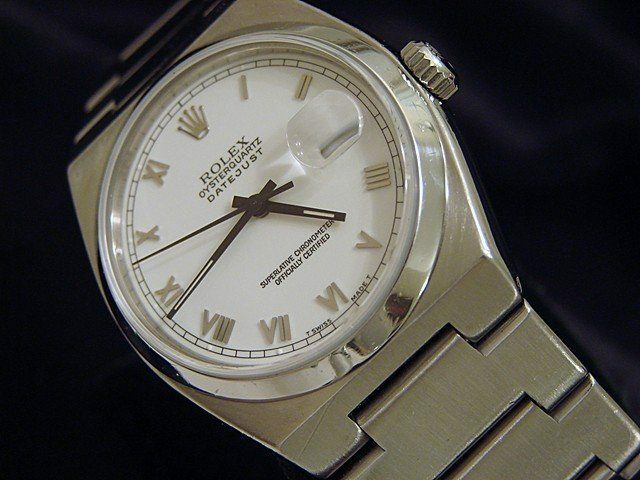 A serviced vintage Rolex watch will run and function to the best of it's ability. Its like owning a "classic car" from the early/mid 20th century. A watchmaker looking for a "parts" watch. Rolex does not produce the parts for this movement anymore. Many watchmakers are always on the "hunt" for these watches so they can use the parts to service or restore their customer's watches. A buyer that is not concerned with timing accuracy, consistency and/or functionality. They are looking for a Rolex that is more of a "piece of jewelry"...rather than a source for timekeeping. A buyer that has (or can source) used original Rolex and/or new aftermarket parts necessary to do their own service and maintenance. A buyer with access to a watchmaker that has (or can source) used original Rolex and/or new aftermarket parts for routine service and maintenance. A buyer that is looking to replace a "lost" or "family heirloom" watch. For many people, a Rolex is so much more than just a timepiece. In general, a vintage watch will not function or keep time like a new watch. Factors such as the manufacturer, model, age, and how well the watch was maintained through the years will contribute to the accuracy, reliability and functionality of the watch. 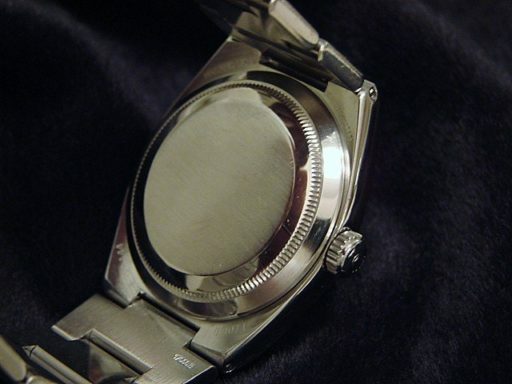 Most vintage watches can be serviced, but due to the age, parts may no longer be available. This means that the manufacturer may no longer be able to service the watch. You will need to have access to an independent watchmaker that has (or can source) used original and/or new aftermarket parts for this movement for routine service and maintenance. It's important to note that having a vintage watch serviced does not mean it will function and keep time like a new watch. A serviced vintage watch will run and function to the best of it's ability. Its like owning a "classic car" from the early/mid 20th century. A Collector looking to add to their collection and understands any of the limitations regarding the timepiece being purchased. A watchmaker looking for a "parts" watch. Many watchmakers are always on the "hunt" for watches that they can use the parts from to service or restore their customer's watches. A buyer that is not concerned with timing accuracy, consistency and/or functionality. A buyer that can source the parts necessary to do their own service and maintenance. 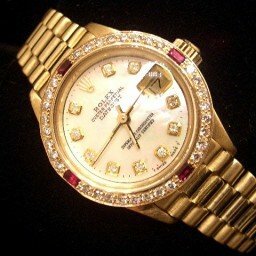 A buyer that is looking to replace a "lost" or "family heirloom" watch. For many people, a watch is so much more than just a source for timekeeping. Every watch has been thoroughly examined and authenticated by our certified master-watchmaker. All watches are checked for authenticity, mechanical, and aesthetic condition and to make sure it is not stolen. Our watchmaker is Rolex certified... meaning he has a parts account with Rolex. He is an actual Rolex watchmaker who is authorized by Rolex to service Rolex watches. This is important because he is specially trained in Rolex watches. We have been in business since 1998 and have NEVER sold a fake or stolen watch. All ROLEX watches offered by BeckerTime are pre-owned. We are NOT an authorized dealer of any of the brands we carry. The Rolex Watch Company Ltd., Rolex Watch USA Inc., or any of its subsidiaries have no obligation to warranty any watch sold by BeckerTime. BeckerTime is the sole warrantor of the Rolex watches being sold. We are not affiliated with any of the fine manufacturers whose watches we sell. We are not affiliated with the Rolex Watch Company Ltd., Rolex Watch USA Inc., or any of its subsidiaries. Like all successful products and companies, the Rolex watch has evolved through the decades. Almost every Rolex model has been around for many many decades. Rolex usually makes changes to each model about every 10 years (give or take a few years depending on the model). This includes changes to the band. Usually, each change is small so that it does not compromise the style and success of that model. 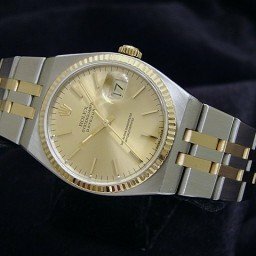 (Example: A Rolex from the 1970's will be a little different from the same model from the 1980's and the 1980's Rolex will be a little different from the same model of the 1990's... and so on). It is a red flag if a new Rolex is exactly the same as one from decades past. 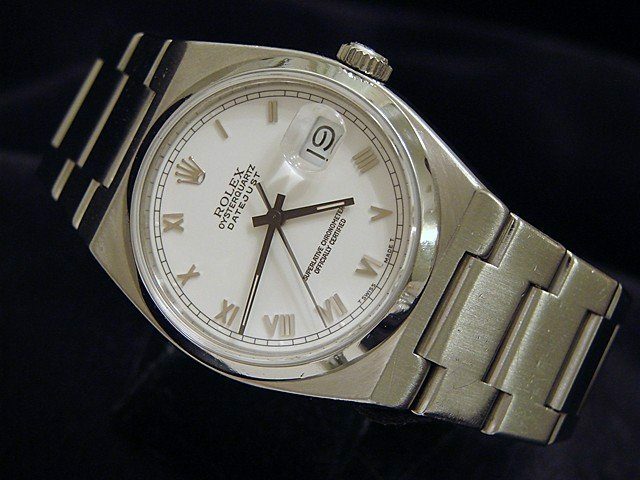 (Example: Although the styling has remained the same, a 1980's Datejust will look a little different than a new watch. This includes changes to the band. A new Datejust will even be heavier than the 1980's model. There have been many changes to the Datejust over the years, with the biggest changes happening mid 2000's). 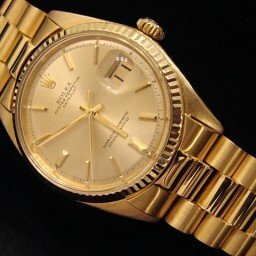 Older Rolex watches typically weigh less than newer watches. This depends on the year of production and the model reference #. Rolex parts and accessories have changed throughout the years. (Example: Before Rolex outfitted their watches with sapphire crystals, they used plastic crystals). If you have been told that the watch is not authentic, I can guarantee they did not show you the key areas pictured above and performed those four verification tests as they are the only "full proof" verification methods. It is important for you to personally see each of the four areas... have them show you these areas for verification. They are not actually Rolex. They are just authorized to sell Rolex watches. Employees that work for an Authorized Rolex Dealer do not need to know anything about Rolex except for the current product they sell. Rolex is just one of the many items that an Authorized Rolex Dealer sells... so it would be impossible for them to be an expert in all years of production of all models and the different changes each product of each manufacturer has gone through for the last 100 years... They just need to be an expert in what products they have in the store. 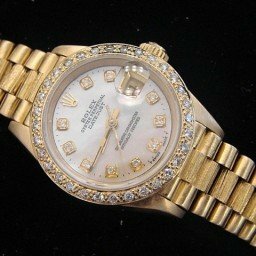 An Authorized Rolex Dealer is the direct competition of an Internet Retailer... except they can not compete with the prices Internet merchants provide. Do not expect an Authorized Rolex Dealer to say nice things about your Internet purchase. If they did, they know there would never be a reason for you to buy a preowned Rolex from them. On some watches, we do use aftermarket parts and/or accessories. Please review the description thoroughly as we provide full disclosure of what is aftermarket. Most of our preowned Rolex watches are eligible for the BeckerTime Lifetime Trade-up Guarantee. Please check the product listing to see if this Rolex qualifies. For qualified listings, we will say if it comes with the BeckerTime Lifetime Trade-Up Guarantee. This means that if you ever want to upgrade to a newer model, a different model, or a different style; you can trade-in your BeckerTime preowned Rolex and receive the amount you paid for the watch towards your new purchase. We appreciate your business and believe this is a valuable benefit with owning a preowned Rolex. See Trade-Up Terms & Conditions for restrictions. Most of our preowned Rolex watches are eligible for the BeckerTime Lifetime Tradeup Guarantee. Please check the product listing to see if the Rolex qualifies. For qualified listings, we will say if it comes with the BeckerTime Lifetime TradeUp Guarantee. Lifetime TradeUp Guarantee allows you to receive full value of what you paid for your preowned Rolex timepiece (price you paid for the timepiece only) towards the purchase price of another timepiece. We do not provide credit for any additional links, bezel, band, clasp, crystal, hands, or dial upgrades. We do not provide a credit for any shipping, taxes, service or repair costs. The price of the new purchase must be at least 25% greater than the cost of your trade-in timepiece. The watch must be returned without any damage or modifications. If the watch has been damaged or modified, the amount of the trade-up value may be less than what you paid. The Lifetime Tradeup Guarantee is not a buy-back program, it is a trade-up program. It applies only to qualified preowned Rolex timepieces that were purchased from BeckerTime. Watches not purchased from Beckertime are not applicable to the Lifetime TradeUp Guarantee. The Lifetime TradeUp Guarantee is non-transferable. If it does not put a lump in your throat, you can send it back for a full refund. NO HASSLES, NO QUESTIONS, NO REASONS NEEDED. Just email us and return it so we receive it back within 30 days. We are not like other dealers where you must wait months to see the credit or refund. 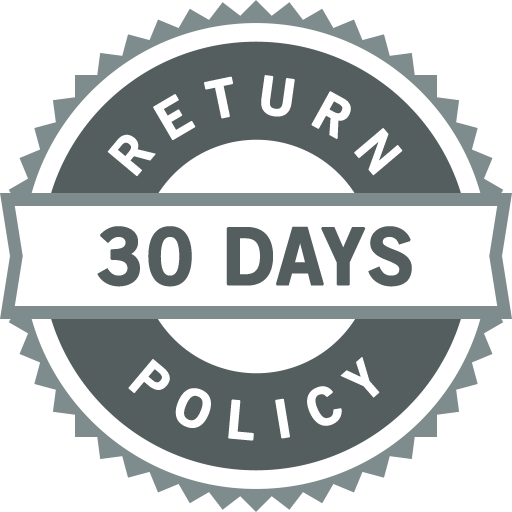 We process all of our returns each weekend and your payment will be refunded no later than 3 business days following that weekend. Also, unlike most retailers, we will not deduct a restocking fee. We will refund 100% of the winning bid amount. THE RISK IS OURS NOT YOURS! Can I return the item for a refund? Yes. Just email us and return it so we receive it back within 30 days. Is there a restocking fee? Is shipping refunded by Beckertime? No. The original shipping fees and the shipping costs back to us are not refunded. Is customs duties and taxes refunded by Beckertime? No. Beckertime does not refund any of the customs, duties, taxes or brokerage fees. You can contact your local customs office or the shipping carrier to request a reimbursement of your taxes and/or fees. Please note that some countries will not provide a reimbursement of your taxes or fees for a returned item. I received my watch and it is not working? Please email us so we can correct the issue to your satisfaction. Occasionally a rough shipping trip and/or altitude & temperature variations experienced in transit can cause a watch to not run properly. Pressure of trapped air molecules inside the case can cause either expansion or compression on the parts of the movement. Of course, this even happens to brand new watches when Rolex ships to an authorized Rolex dealer…except the adjustments of decompression and calibration are usually made in the store after the package has been delivered. Mechanical timepieces are not made to be shipped due to the fragility and complexity of a movement. We respond to most emails the same day sent and always by the next business day. Your message has been sent. We are available during business hours. We respond to most emails the same day and always by the next business day. your next purchase of $2,500 or more. *We treat your data confidentially. We will not share any information you provide with 3rd parties. Beckertime is an independent preowned Rolex watch and fine timepiece retailer and is not affiliated with Rolex, S.A. or Rolex USA. Beckertime sells pre-owned Rolex watches and warranties its watches directly through Beckertime. Aftermarket additions void the warranty of new and used Rolex watches sold by Rolex S.A. or at www.rolex.com. Rolex is under no obligation to warranty-service watches sold by Beckertime through its service locations. Rolex Day Date President, Presidential, Super President, Submariner, Cosmograph Daytona, Datejust, Explorer, Sea Dweller, Air King, GMT Master, Yacht Master, YachtMaster, Milgauss, Prince, PearlMaster, and MasterPiece are all registered trademarks of the Rolex Corporation (Rolex USA, Rolex S.A.) All brands including Carier, Audemars Piguet, Patek Philippe, Ulysse Nardin, Breitling and Omega are trademarks of their respective holders. Beckertime makes their preowned timepieces available for International markets including United, Kingdom, Canada, Ireland, New Zealand, UAE, Kuwait, Greece, Switzerland, Italy, Germany, Spain, Hong Kong, Australia, India, Japan, Netherlands, Singapore, Turkey, Sweden, Denmark, Brazil, South Africa, South Korea, Chile and most others. We do not ship or accept payment from Africa (except South Africa), China, Mexico, France, Vietnam, Indonesia and Russia. Copyright © 1998–2019 BeckerTime, LLC. All Rights Reserved.